Saturday went something like this: a bloody mary, brunch, the farmer’s market, witnessed a LARP battle, another bloody mary, baked a cake, and made a video about baking the cake. What do Brooklynites love? That day. There are probably a few questions in there, like what is a LARP battle? It is this. We stumbled upon one taking place in Prospect Park but I have to admit, as entertaining as the armor made out of take-out container lids were – I was more focused on what I was going to do with my bag full of farmer’s market pears. Anther question: where is the video? Coming soon my friends, just you wait. In the meantime, this cake is pretty much fall in a 9-inch round pan. 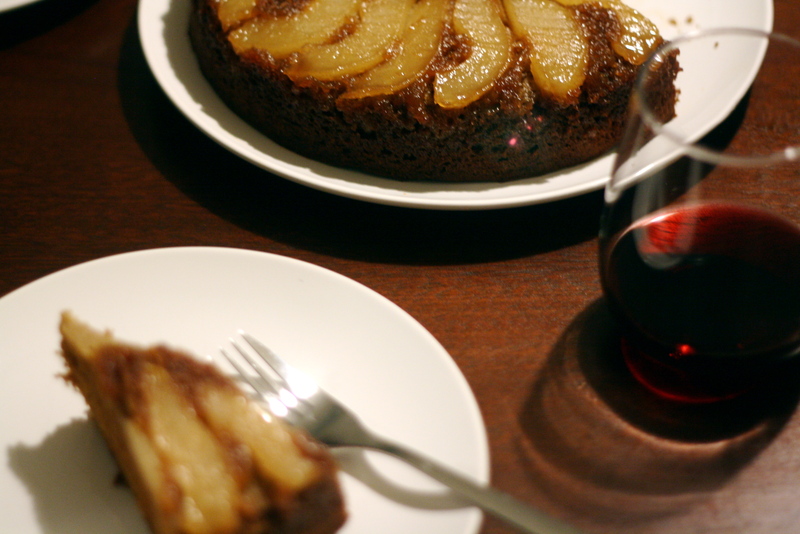 There is brown sugar caramel sauce, perfect pears, and a gingerbread spice cake that bakes up like a dream. I promise you will be seeing a hillside of multi-colored tree leaves just from the smell alone that comes out of your oven. Unless you live in Brooklyn, and then I can promise you will see a slight change of color in the six inches of ivy growing on your fire-escape that you can only see from that one perfect angle in the bathroom. 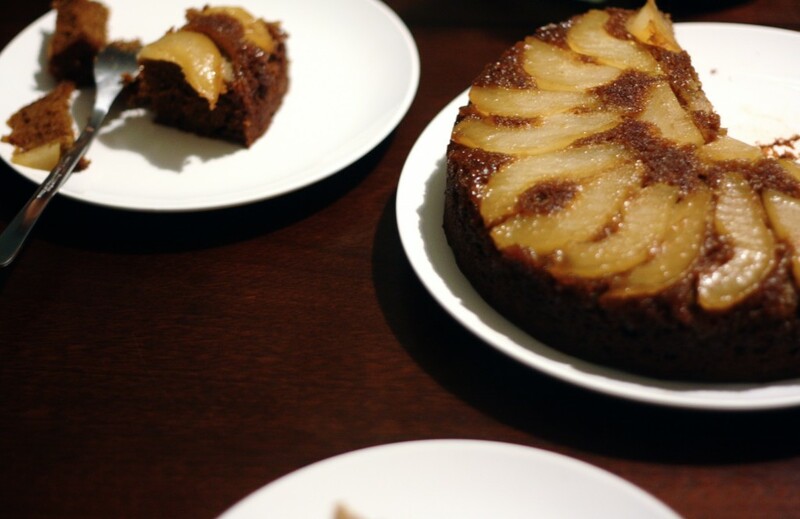 This cake would also be excellent with apples instead of pears, or without any fruit at all and just finished with a little drizzle of a bourbon caramel glaze. Say what? Oh hey there bourbon drizzled cake of my dreams! Preheat the oven to 350. 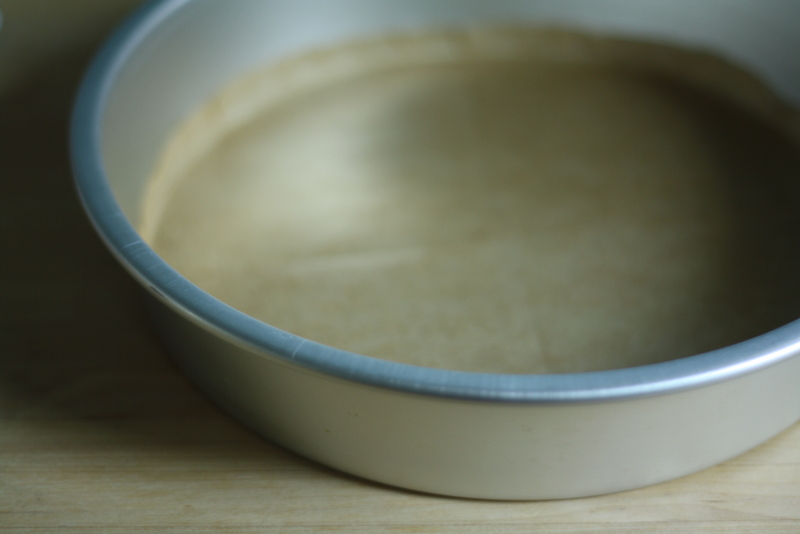 Butter a cake pan, and line it with parchment. In a small bowl whisk together the flour, baking soda, spices and salt. In another bowl, beat one stick of butter until light and fluffy. Add 1/2 cup of brown sugar and beat until combined, then the molasses. Add the eggs one at a time, beating well after each addition. In a medium saucepan over medium heat, melt the remaining 3 tablespoons of butter, 1/4 cup of brown sugar, and pinch of salt until the caramel is bubbling and golden brown. 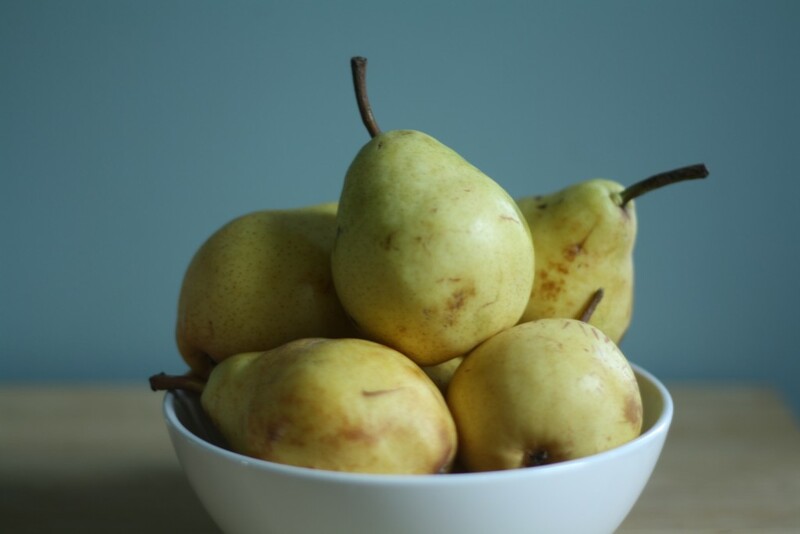 While the caramel is cooking, peel, core and slice the pears about 1/4-inch thick. 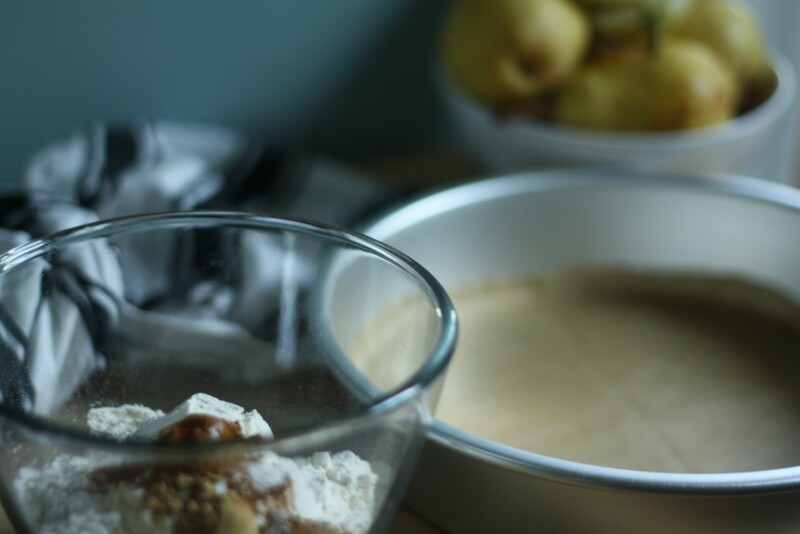 Pour the caramel into the cake pan, and arrange the pear slices so that they cover the bottom and are slightly overlapping. Prepare the cake batter by alternating the flour and the buttermilk with the molasses mixture until the batter is well combined. 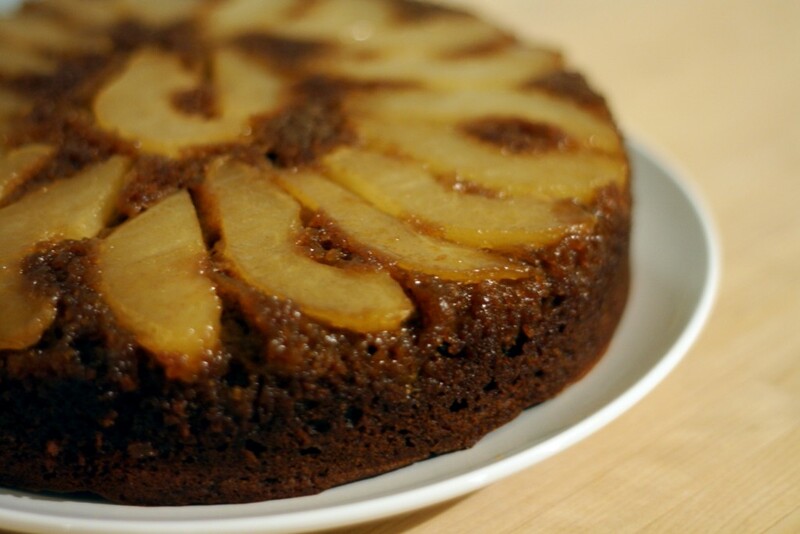 Pour over the pears and bake for 45 minutes, or until a tester comes out clean and the cake pulls away from the pan slightly. Let cool, and flip the cake out on to a plate. Remove the parchment and serve. YES! Or hand-picked dry-harvest cranberries! I’m baking up batches of cakes like these with all of these cranberries I have, and this one I will have to add to the list. Dry-harvest cranberries would be fantastic!! Plus hand-picked is even better! Lillie! 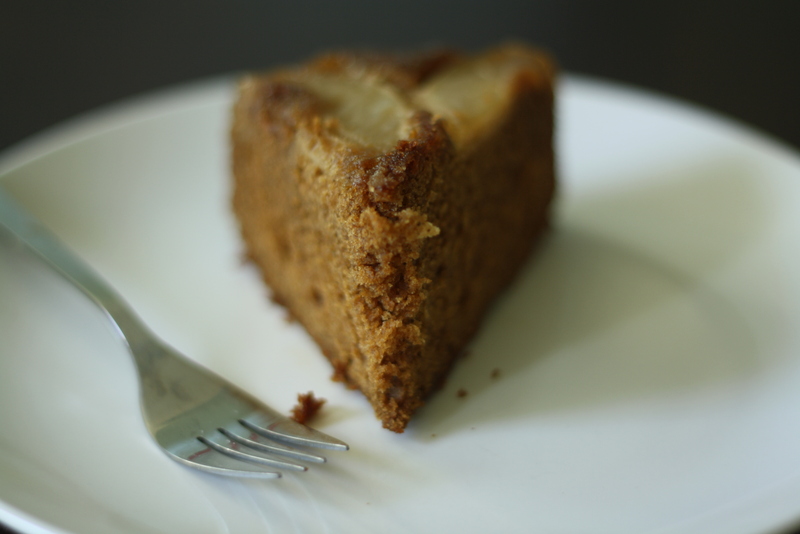 I love this (gingerbread & pear is my new favorite flavor combo) AND your entire blog. I’ve got plans to make every single recipe! Sam told me he used to LARP back in the day. I still love him. Also, this recipe? Mouth.Watering. Bourbon drizzled cake of MY dreams!! ha! amazing! i think you should make this cake and reminisce about his LARP-ing days! This looks delicious, I think I will try it 2morrow! Could I use fresh ginger instead of ground? Yes! I think fresh ginger would be wonderful. Happy baking! Hugely successful! I added 1/2 cup preserved ginger that was finely diced. This is a show stopper cake and EVERYONE cleaned their plates, commenting that they don’t usually eat desserts…… I looked like a genious! Hi Caroline, what a lovely comment to read and I am so happy to hear that it was a hit! Happy baking!